The first five Kestrel Railway Books volumes by David Larkin looked at the revenue-earning wagon fleet operated by British Railways and its successor, British Rail. These were followed by a series of three books looking at the specially-designed wagons that were used for track maintenance, and we now see the first of three volumes covering parcels and passenger-rated stock. All parcels trains required a vehicle in which the guard travelled, and there was usually space for a parcels-related load as well. This volume looks at the various designs operated during the BR period, and to these are added the vans without guard’s accommodation, known as parcels and miscellaneous vans, and the covered carriage trucks. These latter vehicles had end doors to allow vehicles to be loaded, but could also be used as normal parcels vans. Volume 2 covers livestock vehicles, such as the horse boxes and special cattle vans, and perishable-traffic vehicles for fish, fruit and milk. 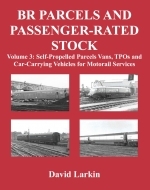 Volume 3 covers self-propelled parcels vans, TPOs and car-carrying vehicles for Motorail services.